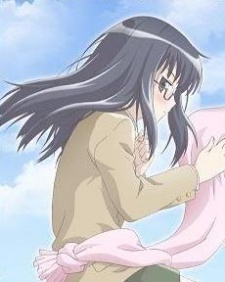 From the anime Megane na Kanojo, Chiaki is introduced as a shy girl transfering into middle school. She is very bad with words and often stumbles, and it doesn't help when her close friend Tatsuya teases her. While she used to be very expressive of her anger and revenge towards Tatsuya in high school she seems to be avoiding him. When confronted she tells him she wants to forget everything about the old her and the past. However, at the end of the episode Tatsuya grabs her hand and her face becomes very flushed and her glasses fog up, showing her true emotions.